Invented long before the days of TV and games, one of the traditional ways to escape into a fantasy world is the classic merry-go-round. With bright twinkling lights, organ music and elaborately carved animals, merry-go-rounds not only take you for a ride, they represent a magical, romantic view of the world, powered by nostalgia. A world of fairies and unicorns, where no one gets hurt and anything’s possible, for a brief turn at least. So if there’s anything that ought to serve as a metaphor for Okayama singer-songwriter SATO MOKA’s music, “Merry go round” is a most appropriate title for her second album and even pictures her on the cover with a unicorn. As mentioned in the past, listening to SATO MOKA with her delicate vocals, charming lyrics, quirky arrangements and diverse modes is a magical experience, like entering a doll house or opening up a music box. So what’s inside this time? Naturally this second album is more focused and features an expanded list of collaborators, including Irie You, Tomggg, ODOLA, Akimoto Shu (DC/PRG, ex. showmore), Harada Natsuki of evening cinema and more. We still get the diversity present in her first album Lukewarm, but it feels like SATO MOKA and her team are getting better at maximizing her talent and figuring out what works best. When you’ve got a special unicorn like SATO MOKA, striking the balance is always the key, and it yields results more consistently this time. With her musical talent, she’s able to take on a range of styles from soul, folk, city pop, bossa, jazz and future, but the songs work best when the production gives her space. It’s done particularly well on “Loop,” where Tomggg proves to be an excellent partner with his sparse beats plus lots of little bells and whistles set up like fairy lights and fireworks. “ばかみたい” has her and Irie You rapping in a kind of conversation about her relationship concerns, but he takes care not to tread on her toes, and the ODOLA production is slick as usual. The musical/jazz track “歌う女” also works great because the big sounds come in the breakdowns and solo sections instead of potentially overpowering her. 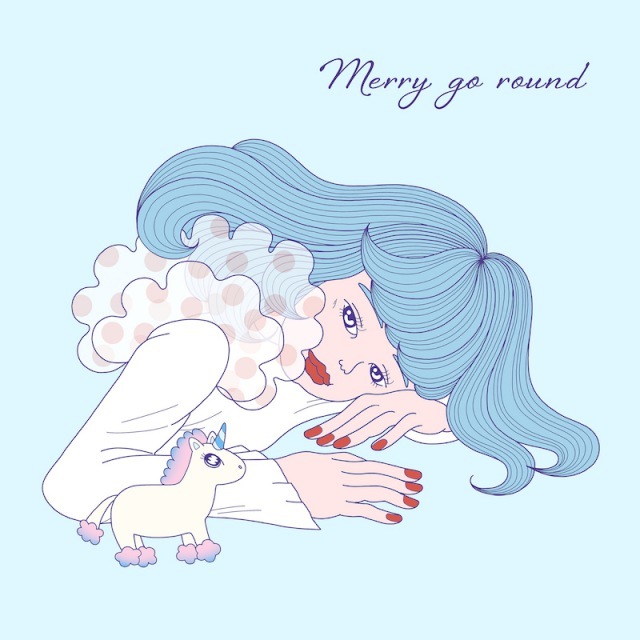 At the same time, Merry go round is a little less random than Lukewarm, which is kind of sad because random is actually good for her. It’s nice to hear textures like environmental sounds and cars behind her like on “ケイトウ,” but it’s a little bit forced this time compared to Lukewarm when it was necessitated by recording at someone’s house. Interestingly, they chose to have a solo version of “スキップ” on this album, which is nice but singing together with Hatsune Miku complements her voice really well, and it’s yet another fascinating angle for her to hopefully explore more in the future. At 32 minutes in length including interludes, “Merry go round” is a pretty short album, but when you have such a unique and magical style, like dessert, festivals, and music boxes its perhaps best served in small doses. Filled with surprises, whimsy and romance, it’s always a joy to listen to SATO MOKA, and “Merry go round” continues to keep us longing for more.